The Vermont Department of Health has quietly distributed fentanyl testing kits to heroin users during the past 15 months as part of a pilot program officials hope to expand statewide. The kits, which allow users to determine if heroin is laced with the potent, often undetectable opiate, have been handed out to 130 people across the state, Health Department officials told Seven Days. Health Commissioner Mark Levine said that the project has been a success: 90 percent of users said in follow-up interviews that they changed their behavior — by discarding the batch of heroin, using less, making sure they had an overdose-reversing drug on hand, or using in the presence of someone else — if the kit detected fentanyl. "The goal is to keep people alive and prevent the person from becoming an unintentional overdose death prior to the time in which they may evolve to wanting treatment," Levine said. "If we can keep them alive ... we know that with time many people will want to seek treatment." The department ran the program in partnership with Vermont Cares, which provides needle exchanges and other harm reduction programs. Vermont Cares sites in Rutland, Barre, St. Johnsbury, Morrisville, Newport, St. Albans and Middlebury distributed the kits, according to Theresa Vezina, the organization's harm reduction program manager. The program comes as deaths involving fentanyl have surged in Vermont. The state recorded a record number of fatal opiate overdoses in 2017, even as the deaths involving heroin and prescription opiates declined. Two-thirds of those 2017 fatal overdoses involved fentanyl, up from 50 percent in 2016, according to the Health Department. The number of fatal opiate overdoses involving fentanyl in Vermont has nearly quadrupled since 2014. The kits illustrated the increasing prevalence of fentanyl in Vermont, Levine said. About 70 percent of the samples that users tested were pure heroin, 20 percent were laced with fentanyl and 10 percent were pure fentanyl. A synthetic opiate, fentanyl can be up to 50 times more powerful than heroin. Early versions of the testing kit were cumbersome and required the user to take several steps, Levine said. 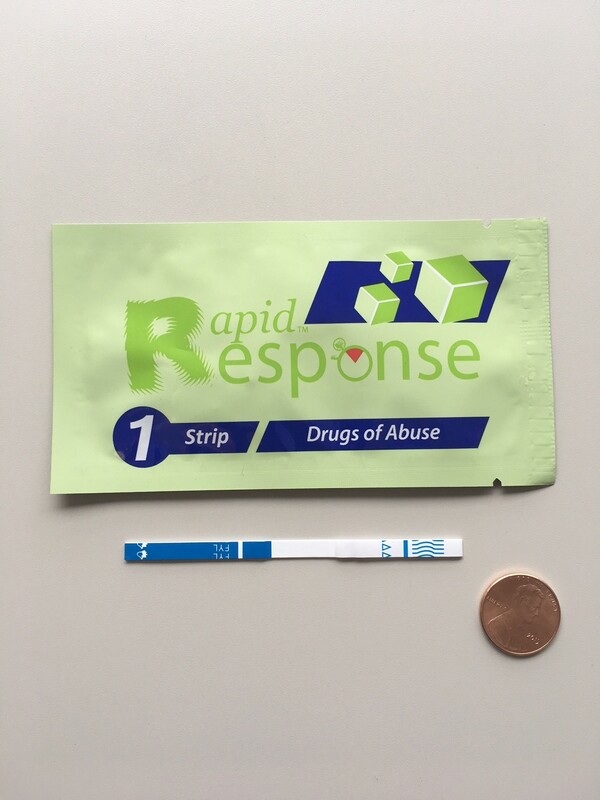 Newer, simpler versions include paper strips that work much like pregnancy tests: Within seconds, one line appears on the strip if fentanyl is present, two lines if it isn't. The strips cost $1 apiece, Levine said. Despite occasional concerns that some drug addicts knowingly seek out so-called "bad batches" of drugs in hopes of scoring a more potent high, Levine said it had not occurred in the pilot program. Health officials are aware that the $2,800 pilot program could be dismissed by critics as encouraging drug use, or even as a step toward de facto legalization. But Levine said the kits fit within existing Health Department programs, including needle exchanges and the distribution of the opiate overdose-reversing drug naloxone, which have been proven to save lives. "We think our behavior towards this is entirely consistent with our behavior toward all harm reduction strategies," Levine said. "If you can't keep someone alive ... you will never get them into treatment." Levine said the Health Department is considering whether it can use some of $28 million the state received in a recent tobacco settlement to expand the program. He said he expects to have conversations with lawmakers in the coming weeks, noting the "compelling data" from the pilot project. Burlington Police Chief Brandon del Pozo said he would be willing to bring the program to the Queen City. "They are not foolproof, but they are a great way to reduce the risk of accidental overdose, and I'm sure the mayor's office and the community here ... would be interested," del Pozo said.